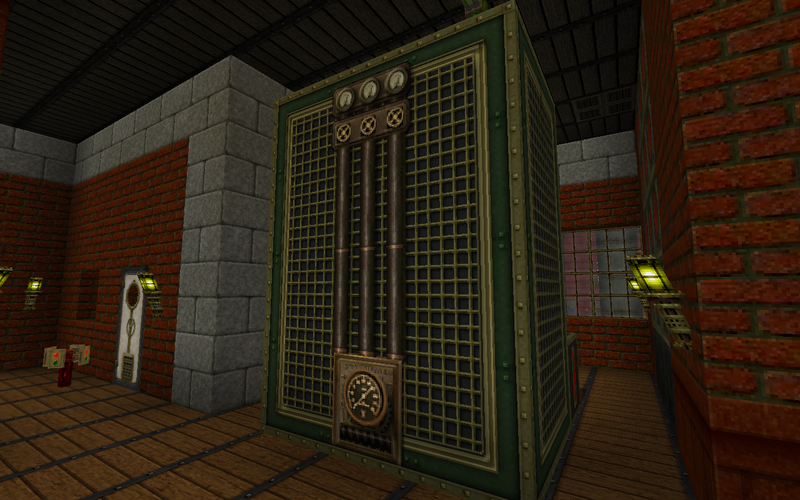 [64x] GLIMMAR'S STEAMPUNK v.22 NOW RELEASED! + Latest Newglim City Download! 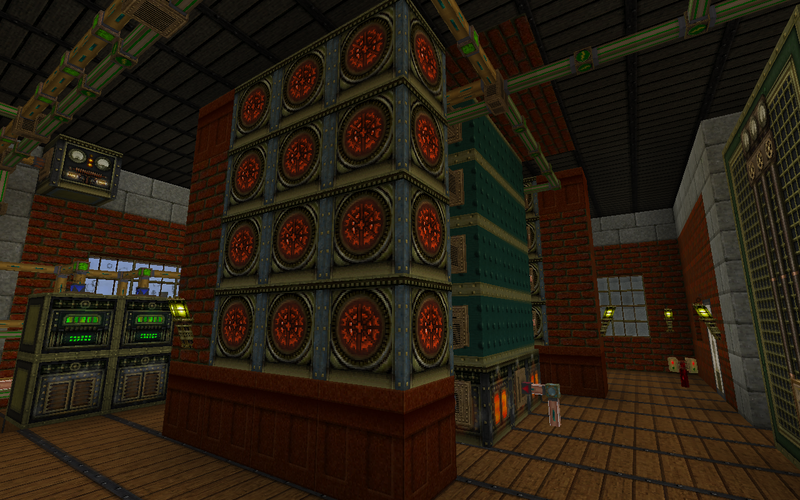 + GS Redstone Pipes Add-On Pack! I'm now in my 9th year of work on this pack. As added encouragement to continue even longer, I'd appreciate a click on my little green 'reputation' button (right at the bottom of this post - bottom left). Much appreciated if you do! If you would like to continue to support my texture pack more actively outside this thread, please consider using my banner in your signature (space at the bottom of your posts) ...thanks again! All content is protected as well as licenced under international copyright law. By default it may only be distributed by the author on minecraftforums.net, or other sites The Owner personally posts it on. 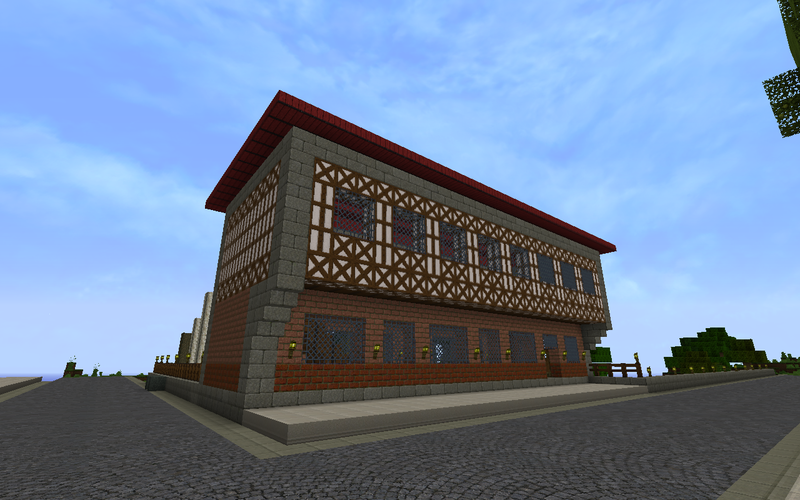 In the event of Glimmar's extended absence from the Minecraft Forums, Glimmar's Steampunk remains copyright and the property of the Owner (Glimmar) according to the conditions laid out below. Any public distribution of the textures supplied within the 'Glimmar's Steampunk' resource pack and other downloadable Glimmar art assets, without Glimmar's written permission, is strictly forbidden. The Minecraft EULA does NOT supersede the Owner's copyright, this licence or conditions herein. Take screenshots and post them here in my thread, anywhere on the Minecraft Forums* or any other third party websites*. Create videos and post them here on the Minecraft Forums* or any other third party websites*. Please let Glimmar know so he has the chance to add them to his user media gallery in the OP. 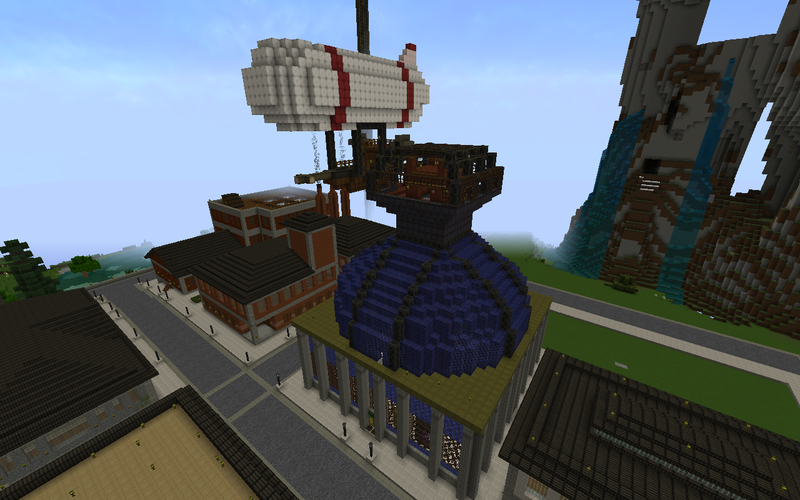 Link to Glimmar's Steampunk resource pack thread on the Minecraft Forums, so other Minecraft users can enjoy Glimmar's Steampunk. *please attach appropriate credit and a link. 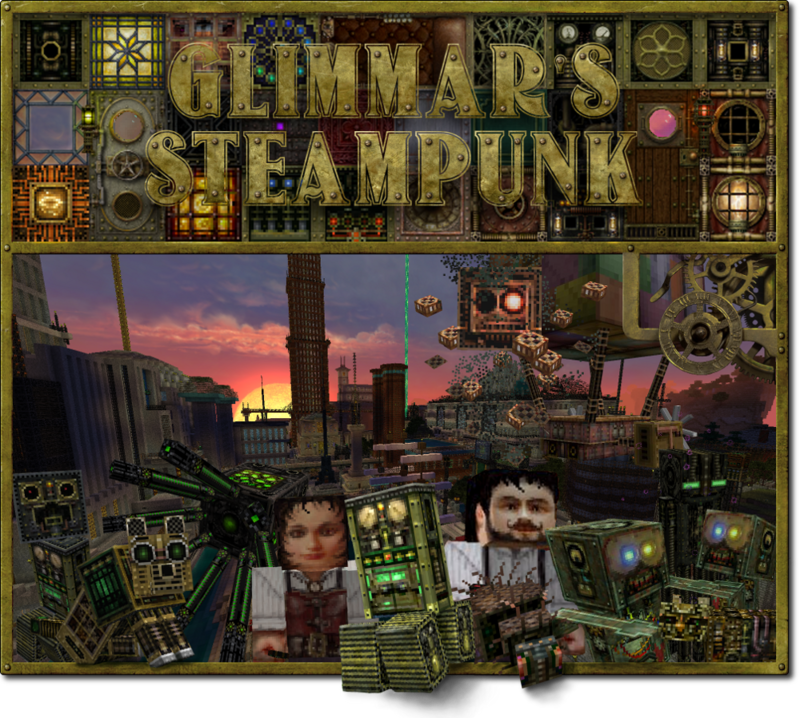 Re-create any of the Glimmar's Steampunk packs. Edit/use/modify the textures or any art assets, other than for personal use. 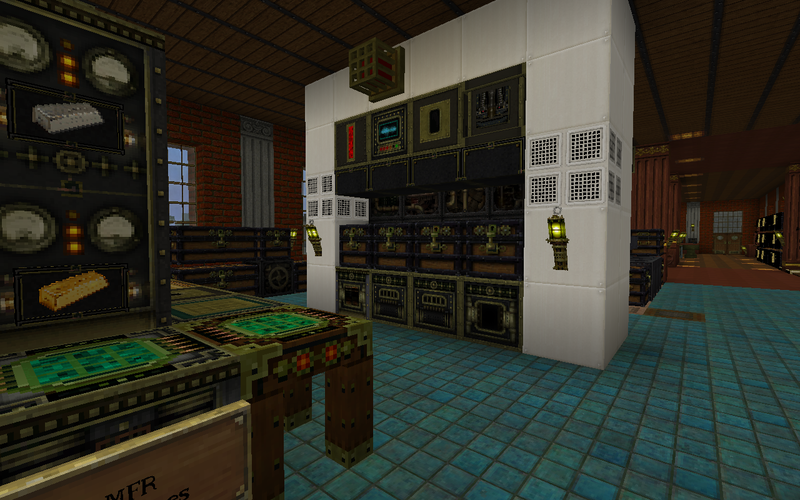 Upload any Glimmar's Steampunk resource pack files, textures or art assets to any third party servers, eg. Planetminecraft.com, etc. Use the Owner's pack for public display purposes as a base for creating your own pack. Claim as your own project / re-distribute in ANY way. Use ANY part of Glimmar's Steampunk for profit using such things as Adfly links, etc. Direct link to my downloads, or re-host my files or art assets. The Author considers this to be piracy, as it bypasses my offical thread and creates problems for both the Owner and the user when things don't work as expected. 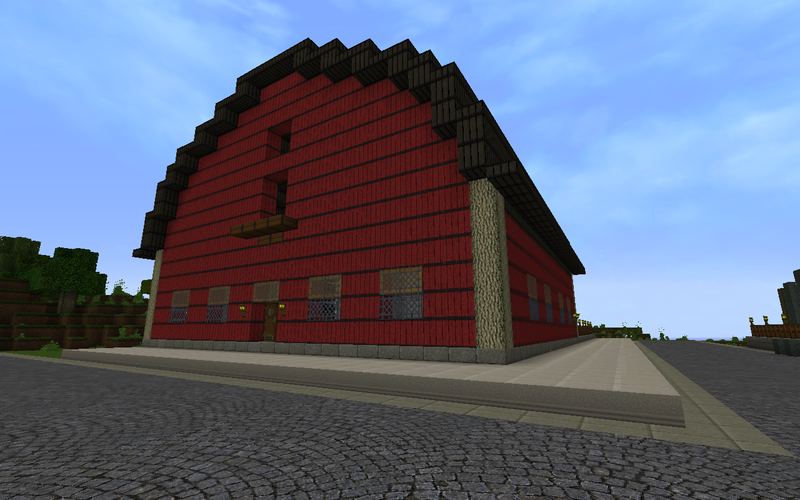 Instead please link to my official Minecraft Forum resource pack thread here. Any contravention of the above conditions will be reported and where necessary the Owner may claim damages and/or take other appropriate action to rectify the situation. Distributing a seperate downloadable unmodified or modified version of Glimmar's Steampunk resource pack or any part thereof (eg. within 'mix' packs), for adventure maps or multiplayer server use, will be deemed as contravening my new licence, will be reported and may result in legal action. Please direct all your players to download the base GS resource pack from Glimmar's thread here on the Minecraft Forums (This means I get fair recognition for my original artwork, and your users understand properly where the textures you are recommending come from). You do not have permission to redistribute or host a modified stand alone version of the Glimmar's Steampunk resource pack or to 'direct link' to any of my resource pack files. ANY necessary modifications to my textures that you feel would be necessary for your world must be made as a separate add-on (ie. not a standalone complete) resource pack, with instructions on how to select and overlay Glimmar's base pack in the 'resource pack folder' in game. ANY modifications of Glimmar's Steampunk textures must be your own work. 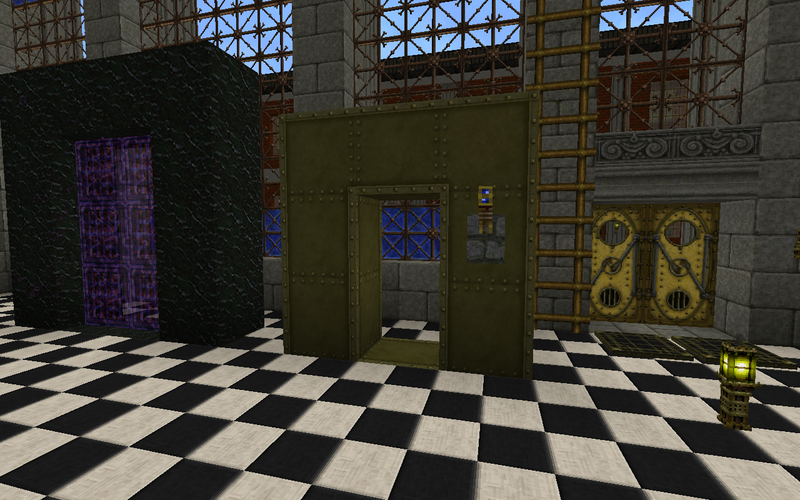 Mixing GS textures with work from any other publicly available resource pack is strictly forbidden. ANY modifications of Glimmar's Steampunk textures used for the purposes of making an 'add-on' resource pack remain the property of the owner of Glimmar's Steampunk, any original artwork you create is your own. Any 'add-on' resource pack made under the above conditions must be distributed through Glimmar's Resource Pack thread on the Minecraft Forums here, not hosted on your own website, separate MC forum thread or any other website. Post a link to your modified pack download in a comment post in Glimmar's Resource Pack thread on the Minecraft Forums and redirect your users to use this link (that way they can always get the most up to date official pack without having to wait for you to update your custom add-on version). Conditions for making supporting textures for mods in the style of this pack are now the same as for Multiplayer/Server/Map/Adventure (see above). 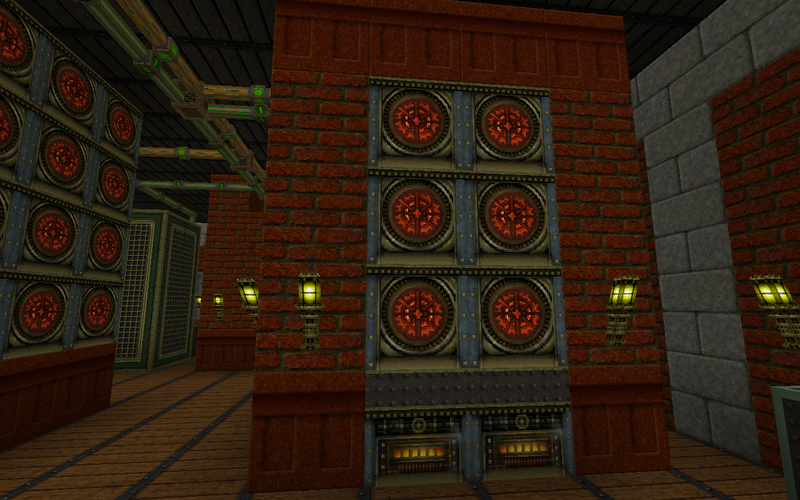 Exceptions to some of the above conditions may be made for existing Glimmer's Steampunk mod support artists, to give time to re-direct all users to download mod textures from the Glimmar's Steampunk thread on the Minecraft Forums. Please see the 'Fan Made Mod Support' section below for further clarification. The Optifine mod makes use of my CTM 'connected textures', my animated 'BetterSkies', random animated extra mobs and villagers, animated GUIs, extended range of animated paintings, Better Colors, BetterLighting, etc. Without Optifine you will be missing out on all of the above and much more! This pack is now designed to take full advantage of the appropriate version of the Optifine mod. Glimmar's Steampunk resource pack will still work without installing Optifine, but your 'in-Minecraft' experience will not compare with what you see in the above showcase videos or pics. Please note: If minecraft begins to lag severely for you after installing Optifine, this is most likely due to the number of extra animated blocks, items, gui, mobs, etc. 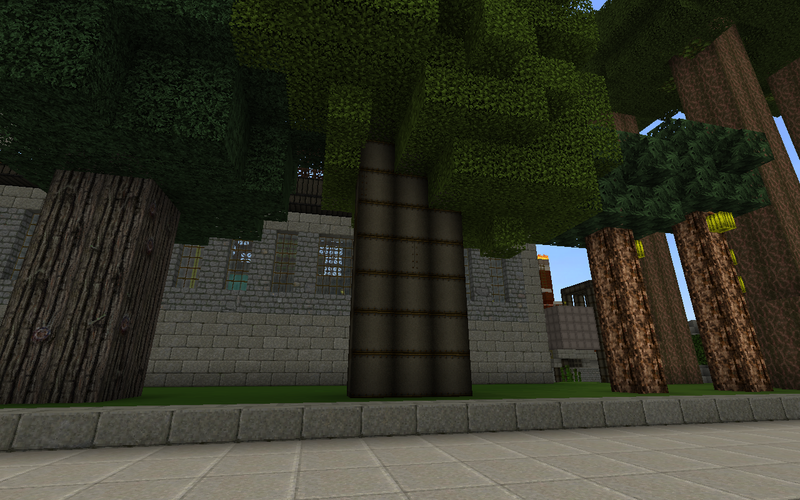 included in the GS resource pack. To fix, play around with options within Minecraft where, if you have installed Optifine, you'll now be able to switch off animations, and alter many other video settings, etc. I believe this can greatly increase frame rate for some, whilst still retaining the benefit of all those thousands of extra ctm textures. By downloading and/or using my 'Glimmar's Steampunk' texture pack, you agree and validate my licence and conditions of use, as laid out in my 'Legal' section above. Vondell...chicken, some weapon and tool items, cowhide. asikar...Gold and diamond swords have been upgrade. 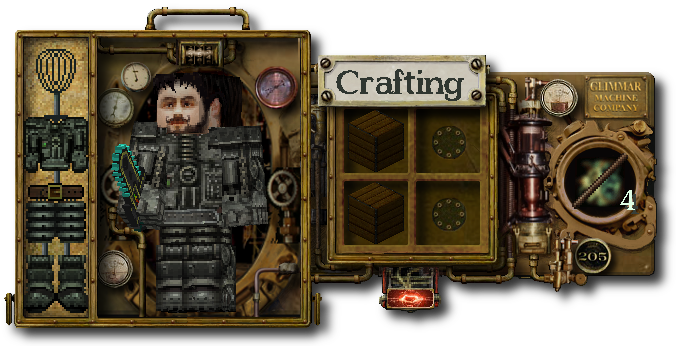 BloodJack...for providing the original crafting and furnace gui layout - still partly used as the basis for my current extensively modified animated versions. PATR101...for animating the flowing lines on my eye of ender block*, originally animating my craftbench* and musicplayer* blocks. Giving me the time to work on other things! Balduran...pigzombie15* Adapted by Glimmar to fit his new 'pigzombieman' design. * partially or completely derived from my textures. I am always happy to receive original alternative contributions in this thread, but I no longer wish to use the work of others directly in the texture pack. 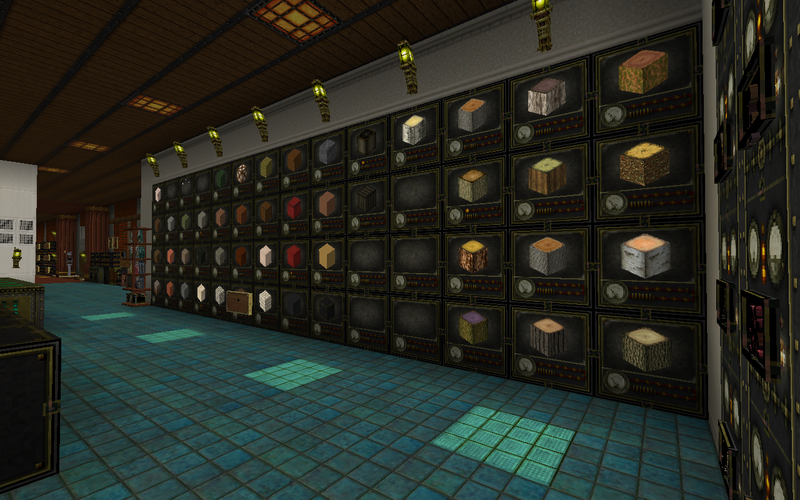 Unfortunately I now no longer have time to keep updating my Alternate Textures pack with contributions. If your submission makes use of my own work, please keep your posts within my Glimmar's Steampunk thread, as such derived artwork remains the property of the owner...me! All work must be original or adapted from my own work. Under no circumstances should you use work from another resource pack...even with the artist's permission, and please don't cut and paste images directly from Google. I wish to preserve the individual style of the pack and in so doing also avoid potential arguments regarding copyright. I am very grateful for everyone's input, whether it's just a friendly compliment, suggestion or donated alternative edit...it's always encouraging! Please note: These downloads are not 'resource packs' that can just be selected in-game, they are a vast collection of original alternative textures which you can dip into to customise your personal version of my pack and, like the rest of my work, is only for Glimmar's Steampunk use, is copyright and is subject to my 'legal' conditions (see the relevant section in this post above). Any modifications of my work donated for use in the 'Glimmar's Steampunk User Made Textures' download is subject to my legal conditions. If a user submits his own original artwork and you wish to make use of this outside the confines of Glimmar's Steampunk then you must first seek written permission of the contributing artist before commencing work. boats and 'paddlesteamer' mod skins. mob and steampunk character skins. and hundreds of miscellaneous textures. In most cases, since MC 1.5, individual alternative textures can just be dropped into the appropriate folder in the resource pack, but you will need to check and change the file name, as all texture names were changed by Mojang in the MC 1.6 update. Some animated textures have accompanying '.mcmeta' or '.properties' files and if you wish to change these for an alt, you may need to edit or delete these particular files or Minecraft/MCPatcher might get a little confused. Some alternate textures like the steampunk clock or lo-res Better Skies will work fine with the '.mcmeta' and '.properties' files that are in the pack...it's just a case of dropping the alt texture in the right place (again, just make sure the alt file name is the same as the one you are replacing). Please check the 'Changelogs' in the pack or ask in my thread if something is still not clear. No work included in my 'GS Alternative Textures' downloads has been acquired from any other thread within the Minecraft forums, it includes both original artwork by me and work edited by others derived from my own alternate textures. Any work that is not my own has been freely (and generously) donated within this thread for use within this pack. Permission and submissions granted throughout this thread. This section is very much a fan-based endeavour. There are so many mods I would love to support, but I have to be realistic and admit any spare time I have is expended on improving the main pack. I have provided probably one of the largest collections of alternative textures for any pack (still growing) and some GS fans are using these and their own artistic skills to create sympathetic Steampunk textures for mods that compliment my pack. I am very grateful for their input and support and in particular to MegistusEligius for creating such a massive selection of Glimmar mod support textures presented below. If you would like to help support Glimmar's Steampunk by using my textures (see my collection of alts above) or your own skills to make Steampunk equivalent mod textures in the style of this pack, to add to the growing collection here, just give MegistusEligius a shout first or myself...and I'll give him a shout...he knows a lot more about Minecraft Mods and will probably know if something is already covered. If your contribution is more than just the odd texture, then have a chat with Glimmar about making your own shop (banner-sized) sign to hang here in 'Glimmars Mod Emporium' (See Megistus' example) and help make the place look like a real Victorian emporium...the kind of quirky place you'd really like to peruse for those weird and ingenious must have gadgets and gifts! 1. Any work submitted must only contain either your own original work and/or my own textures (found within this thread), modified/unmodified as you feel necessary to fit the mod. 2. Please remove any textures belonging to other artists before submitting your mod support file/s in the Glimmar's Steampunk Resource pack thread. With the best will in the world, I cannot be expected to be familiar with all your sources for the textures you submit, and what might be fine for personal use is not legal to distribute in this thread. Even if it was, it is a matter of principal and originality that we don't use work from other texture packs. If you're not sure where something came from...then leave it out...better to be safe than sorry! 3. Please upload your mod texture support link here in my thread as a post to be included in the Mod Emporium (consider making a banner and opening up a 'shop stall'. See Megistus' example). I now require all download links involving my textures to be exclusively sited in the Glimmar's Steampunk thread here on the MC forums. 4. Make sure I am clearly credited in your post in the mod thread for which you are making supporting textures and then link back to my thread here for the duration of your mod texture support pack availability. You may post screenshots and banners and other advertising material in the mod thread for the purposes of highlighting your Glimmar's Steampunk mod support. 5. Make sure you provide proper documentation in your mod support pack by way of a 'readme doc' including a statement that my modified textures are copyright, with clear credit and link information back to my thread . 4. Under no circumstances may my textures be redistributed in a standalone texture resource pack, ie as a Tekkit or FTB Glimmar's Steampunk pack. Mod support textures in the style of Glimmar's Steampunk, using the Owner's art assets, must only be offered as individual mod support texture files to work in conjuction with the Glimmar's Steampunk resource pack. Put simply, the Glimmar's Steampunk reource pack must only be downloaded via the Owner's official threads on the Minecraft Forums and Curse/Forge sites. Permission is not given to redistribute/host a complete modded standalone version of Glimmar's Steampunk resource pack, nor to redistribute/host an original complete texture resource pack with any of my textures included ('mix pack'). Furthermore, we have more textures for ComputerCraft, created by Blanco_Meneige and building off of VermillionTwilight's work in that area. We now have a rather good looking GUI for a fair number of the ComputerCraft devices, although I have been experiencing some odd behavior with the monitor. They are included in the above download, and if anyone can figure out how to get the monitor to work properly, it would be greatly appreciated. 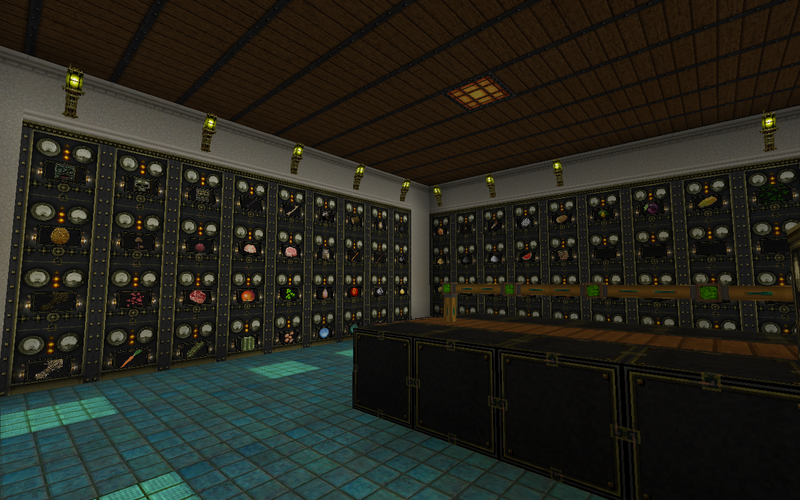 Instructions and credits are included in the mod pack download. 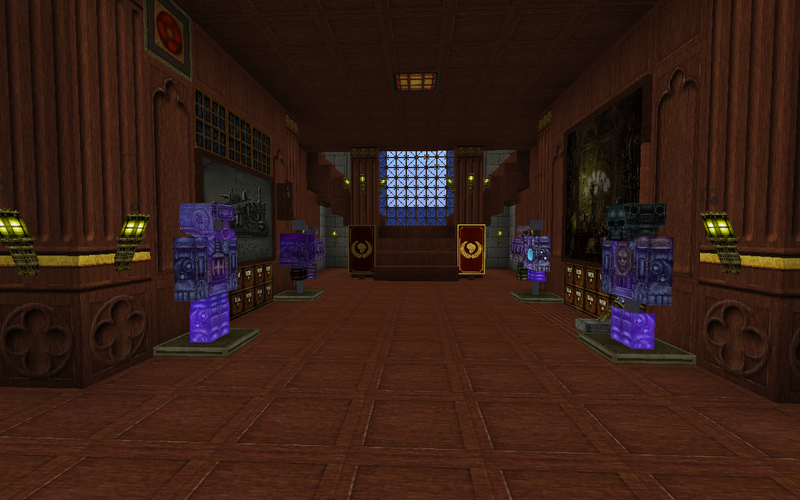 Please note: Many images depicted here may be displaying very modded or outdated textures. 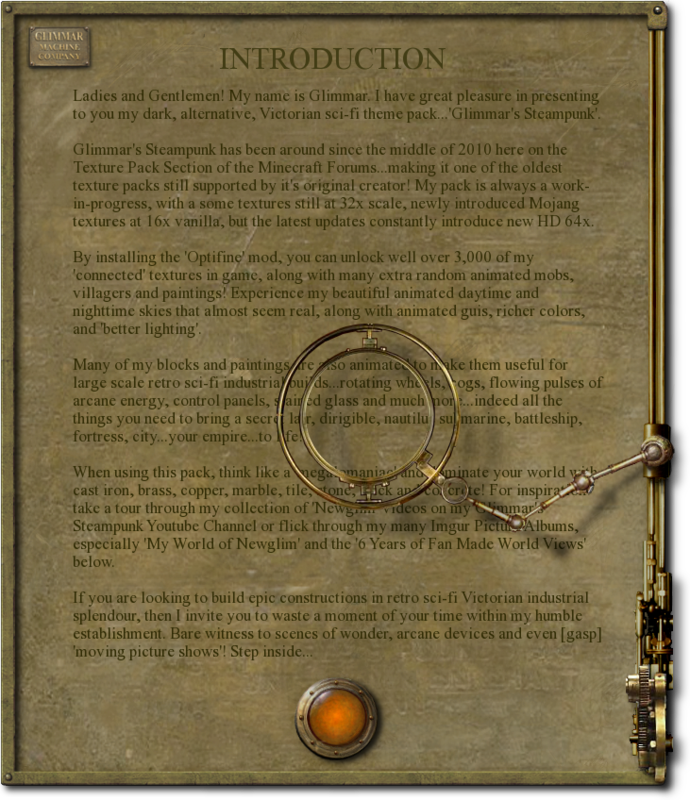 Click the banner for some inspiration on what gargantuan wonders can be made using Glimmar's Steampunk. 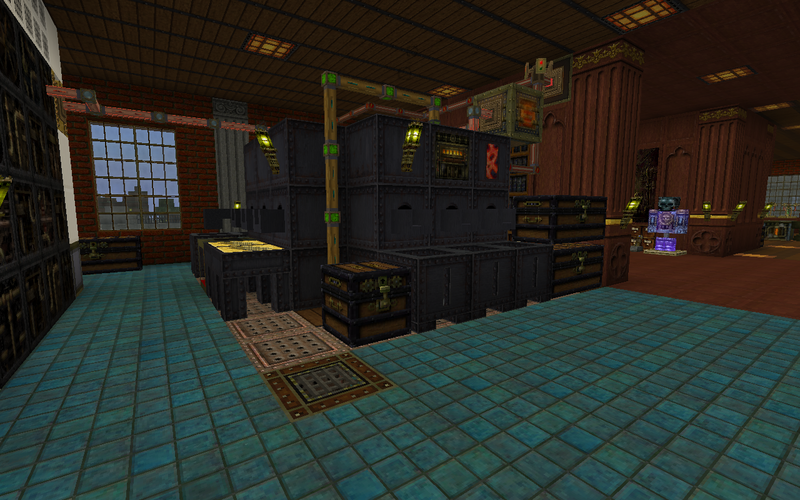 .....So...What to Build in Your Own Steampunk World? 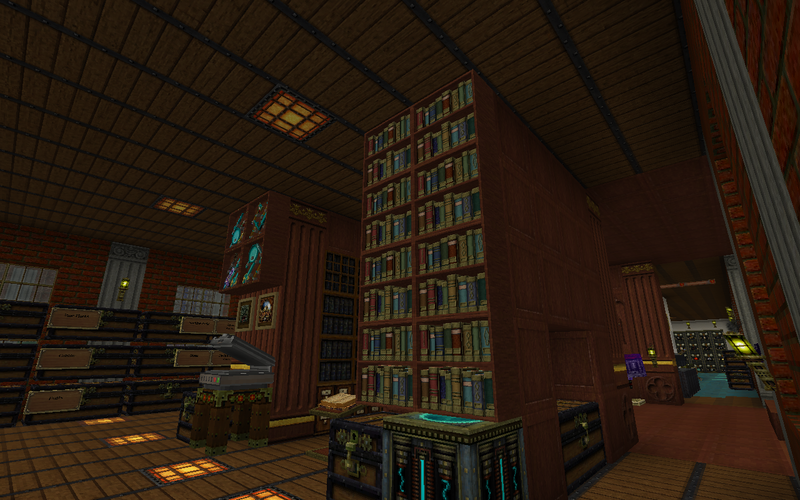 If you have ideas for any other steampunk world constructions, let me know and I'll add it to the list. Hello World. Steamcraft! My day has been made. Looks very good, please do keep up the good work. I currently have a Let's Play and time lapse series. Hope that's a 'good' wow and not a 'bad' wow virulentRant. Now THAT is truly amazing! I'd love to have that texture for my game. :smile.gif: Keep up the good work, and I'll be sure to keep an eye on your project. Why on earth would it be a bad wow? I wish I could, but there's too many things still to do. Especially sorting the cobblestone and granite. Wow! Sooo difficult to get just right. Especially for this theme. This looks absolutely fantastic. This may very well usurp the Painterly Pack for me. Excellent work. 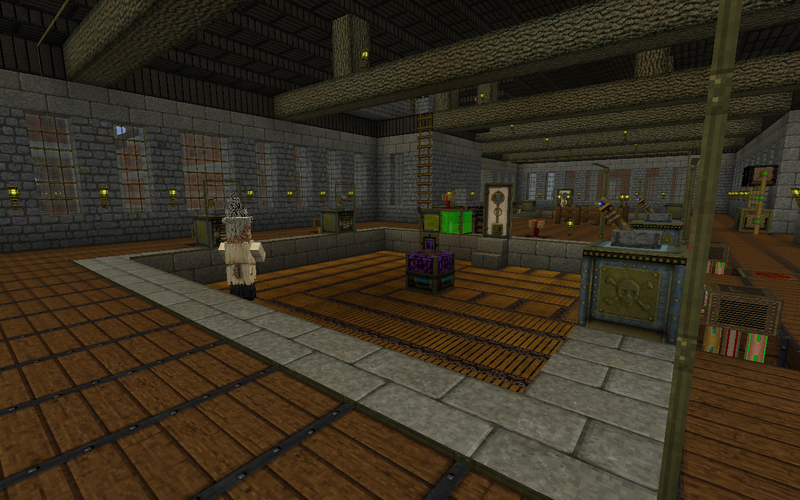 :biggrin.gif: I'm really diggin' the lamps, doors, and crafting table. The smoothstone looks a bit like gravel though, so you might want to make it darker or change it somehow. 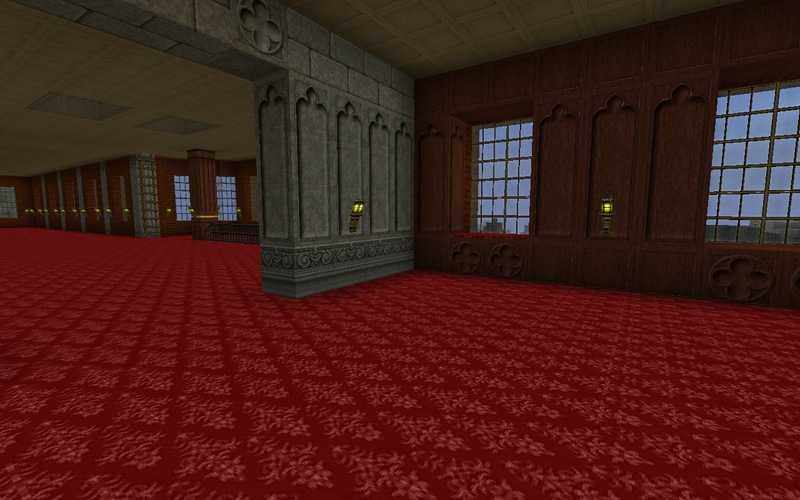 I like the details, but it clashes with some of the more plain textures.. There's also some difference in contrast between blocks, like some blocks have black lines while others are rather bright or more dull, it's very skilled work but I think you need to look how it all matches together. ps. at the very worst if I eventually flunk the 'building' blocks I'll just release the individual elements like doors, iron, etc. for the community to use as they see fit, but for now I'll struggle on. Woe is me! Thanks, Jagadance. Will get right on to it! Lots to get right about it too. Just glad those lookin' in seem to be liking the theme. Huge fan of the green torches, look a lot more mystical that Red. Are you going to do items, too? That'd be the best selling point, as Minecraft's gameplay doesn't generally lend itself towards a steampunk-ish atmosphere. especially the doors and iron! looking forward to seeing what you do with redstone. I've already made the redstone, diamond and coal block, but I'm stumped on how to to get those displayed together on the surface without using something like InvEdit or something. Being the purist mega miner that I am, I never wanted to use any editors for fear of being accused of cheating ... when I eventually show everyone my world! Any suggestions, anyone? I don't really want to have to mine all the way down to adminium to take a snap shot! Is InvEdit the only way to go? Would love to do items too, but am amazed already what a struggle it is so far! If I knew now what was involved in doing a texture set ... I definately wouldn't have started, but it's been a great learning curve and I've found out more about 'alpha channels' and tesselation than I think I ever cared for!! 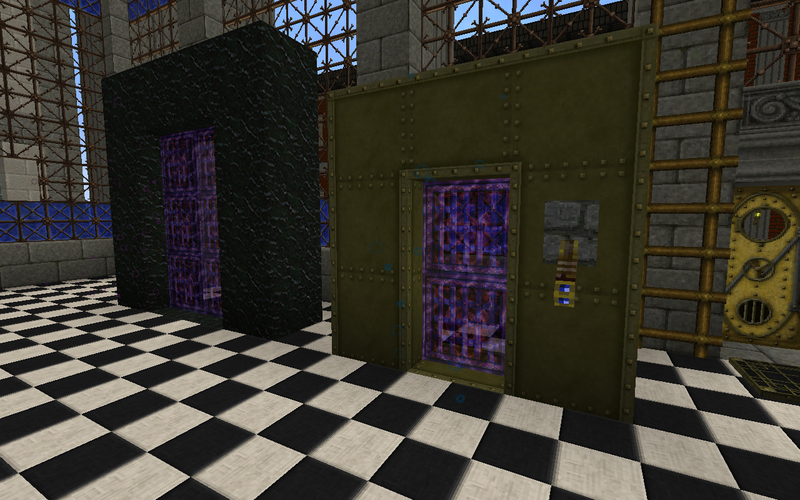 Once the world textures are done I'd give it a go If the inspiration isn't drained away. I noted in my ideas/sketchbook that it might be possible to replace the bow and arrow with a more gadgety dart crossbow gun so the sound effect would still be appropriate and would still be in keeping with the handmade feel of a minecraft world. I wouldn't mind if anyone else had any ideas for the items. 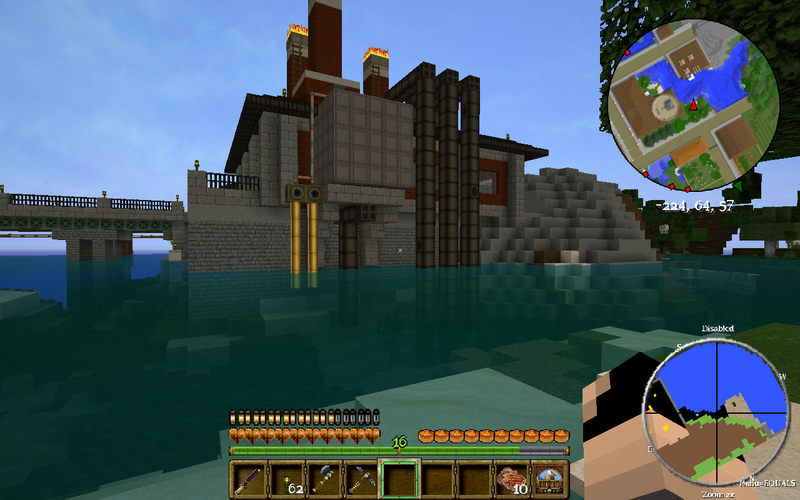 I love stretching the limits of what can be done with minecraft as it's such an awesome gaming/architectural phenomenon. I guess I lied about the "definately not starting another..." as I'd love to see if it was possible to do textures on an "Egyptian" or "Aztec" theme. However...on with the Steampunk for now. Gotta say this is probably one of the most unique/creative texture packs I have seen yet. As someone else posted I really like the green torches - simple yet really gives that steampunk kind of feel. The gears and colors you chose really add to the overall feel as well. Keep up the amazing work!